Automatically inflates when wrist is at heart level and indicator lights make it easier to find the correct position. Silent and quick inflation, so measurements can be taken quietly anywhere, anytime and even more discretely. 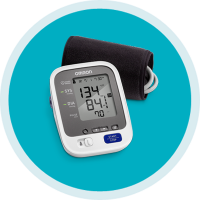 Blood pressure level bar shows how your reading compares to the internationally recognized guidelines for normal blood pressure levels. Slim design is discreet, convenient and portable so you can take measurements when you need to. 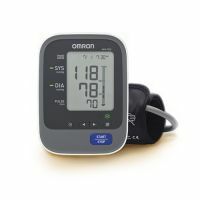 Irregular heartbeat detector detects and alerts you of irregular heartbeats while your blood pressure is being measured. Advanced Averaging technology displays the average of the last three readings in 10 minutes. 100 Memory storage with date and time stamp allows you to review the last 100 readings with a touch of a button. Fits wrists sized 5 1/4" to 8 1/2" in circumference. To Recieve updates and possible rewards for Omron BP652N please sign in. To Recieve updates and possible rewards for BP Monitor please sign in.